Her granddaughter remembers her Grandmother having a "Jenny all things" shop. On one side of the aisle there would be "tatties and cabbages" and on the other "sweeties". At Christmas there would always be a big box of Fry's Chocolate Cremes (which is where she got her life-long taste for them !). 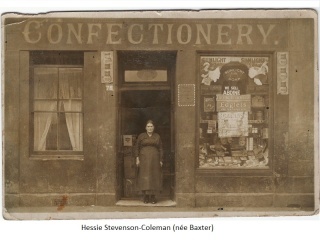 The shop was opposite the "penny buffs", the Govan Mixed Infants School. She would come over regularly to the playground and bring sweets for her favourite grandchild, Hessie's brother .